← 3 marathons in 3 weekends in April all in sub3h30?? 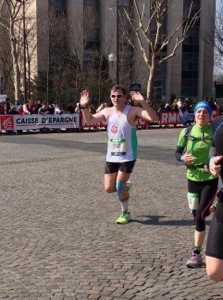 So I am back from a weekend away in Paris with Katie for my first marathon in the #3marathons3weekends challenge. 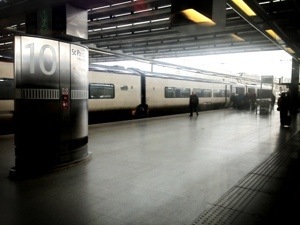 We arrived mid-afternoon in, a slightly warmer than London, Paris. 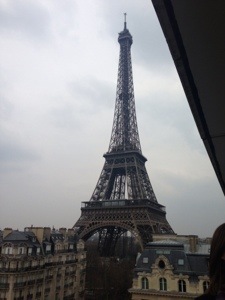 After a bit off a faff on the metro to get to the hotel, we were welcomed with a room with a view! 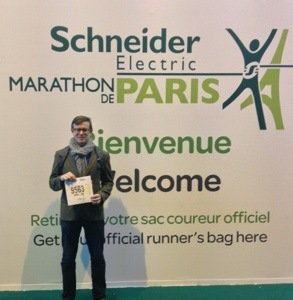 Then we headed off to the Expo to collect the race number and goodie bag. The Expo, like heading off to Excel for the London marathon, is a bit of an annoyance when you would rather be off your feet, but also adds to the excitement of race day. 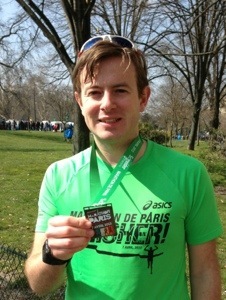 One nice touch at the Paris marathon is getting your name printed on the bib number. 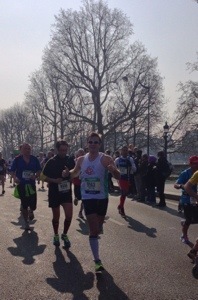 And it worked as I got a few shouts of “Super Chris” (in French accent) on race day which helped spur me on. After a pasta meal for a bit of carb loading, it was time to get some sleep for race day. On the morning of the race, I made sure I got a decent breakfast (2 slices of strawberry jam toast, chocolate curls cereal and a mini pain aux raisin) it was time to head off to the Champs Elysese for the start. 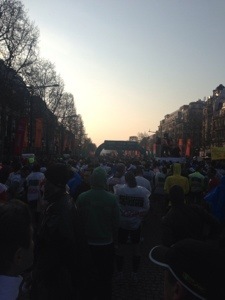 I was in the yellow start for the 3h15 a 3h30 runners. So in this pen I didn’t want to push too close to the front. The mistake I have always made in my 3 previous marathons is setting off too fast 3h15 – 3h20 pace and then paying for it at mile 20. At Paris they do something different to the start in London. After firing the cannon for the elite start, there was no movement from our pen. It took about 5 minutes for them to open the pen, and we then walked forward to the start line where we were held again for a few minutes before being released onto the 42.195km course. The Champs Elysese is nice and wide so you can set off at your desired pace straight away instead of fighting for position and being stuck behind runners who shouldn’t be that close to the start! The early start meant that it wasn’t that warm at the start, but also meant that the first 5km were I’m shade so pretty chilly. But as the road wound its way through the city and out to the first parkland it soon warmed up. I needed to ditch the extra top I was wearing at 12km as I worried it might cause over-sweating and hence cramping later on. Following mis-pacing previous marathons I was concentrating on following the pace guide on my Garmin and sticking closely to the 4:59min/km target pace. I stuck with this fairly well upto the 16km point, gaining only a minute, so re-adjusted my target pace to 4:56, and hence zeroing the one minute gain. I saw Katie at the 27km point and was feeling good and well on for my target, but at the back of my mind knew there was still a long way to go, and another few km to the magical 20 mile point. Getting to the 20mile point I knew I could do it, and it added to it when I was passing people at this point who were probably feeling like I have before and succumbed to walking. But I was sensible not to up my pace and just bring it home, otherwise I could have been just like them in 500m! Going through the park by Long Champ race course was a different experience to London, as there weren’t that many spectators, unlike the stretch from the Tower of London to the finish which is 3+ deep. Getting to the 37km point I knew it was just a parkrun to go. I could easily visualise this as just 3 laps of Dulwich Park, but a 25 minute run instead of the 19 minutes I usually do it in. I saw Katie again just before the 42km mark, and picked up the pace from here as by looking at my watch I knew I would run under 3h30 and even if I was to cramp I would have enough time to walk/hobble in. So 1 marathon down and 2 to go. Over all I think I have got the right mileage in the bank and Paris marathon’s pace wasn’t too difficult, so I just need to recover correctly this week (helped by my compression leggings) to be ready for Brighton. 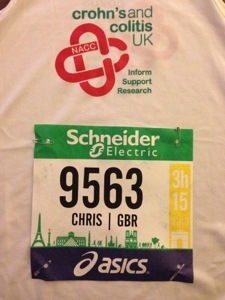 Also a massive thank you to everyone who has sponsored me so far, I’ve broken through the £500 mark. All your support has not only motivated me throughout the long training runs but also helps my chosen charities. 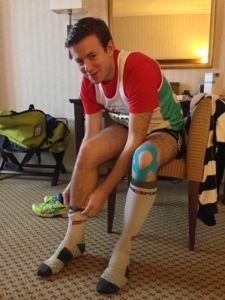 This entry was posted in races and tagged 3marathons3weekends. Bookmark the permalink.